Bali is where I will spend my next 2 weeks holiday. Actually, it's way too quite for comfort here in our Phuket Spa resort, so I am voluntarily taking my vacation and return to my home-base in one of the Spa resorts in Bali. No, I am not going to enjoy massages and la 'dolce far niente', I am just going to continue working there. Then it will be up to the management in Phuket whether they have enough tourists to need me back or whether I can be more useful in our Bali spa resort. So where is Bali Island? Bali is in Indonesia. It's one of the 17,000 islands. 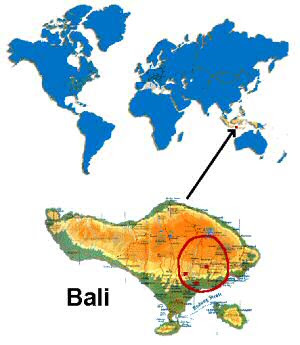 Bali is 145 km (90 miles) long and 80 km (50 miles) wide. Bali is situated just east of the island of Java and west of Lombok. Most of Bali's 3 million people are Hindu, which for me makes it an ideal spa destination. But that's just because I love the Hindu way of every day making small offerings to the Gods. It keeps you in sink with nature and the creation in a beautiful matter. Bali offers something for everybody, just hire a driver and a guide and get around the places you want to see.